Shelton-based designer Agathe Likoba is preparing to open a new boutique for her high-end jumpsuit clothing line, Likoba, in downtown Derby. Fashion boutiques may not be top of mind when it comes to Connecticut’s smallest city. Local designer Agathe Likoba is looking to change that. She is preparing to open her flagship boutique, Likoba, in downtown Derby at 25 Elizabeth St. in the fall. Specializing in high-end jumpsuits for women, the shop will open Sept. 8, offering a mix of high-end and affordable selections. The opening is timed to coincide with New York Fashion Week. “I spent some time in Derby, and the first time I went there was just a feeling. I got in town and I really love architecture, so the buildings and the ambiance were really interesting, and I fell in love with it,” the Shelton resident said. Her interest grew when she discovered a fashion history in the Valley city that included the manufacturing of corsets and hoop skirts. Companies like the Kraus Corset Factory, which was at Roosevelt Drive, sat among a trove of manufacturing sites in the 19th century. For Likoba, who spent her childhood in Bruges, Belgium, it was a reminder of her childhood watching women dress up. The France native has a been a Shelton resident since 2014, but she has lived throughout Europe. With an interest in fashion that stems back to her childhood, Likoba chose Derby because it reminded her of home. “I’ve always been surrounded by women who were dressed up to go to different events,” she said. After meeting the residents of Derby, she was sold on opening her first boutique there. “Once I found a space there, I knew that’s where I had to be, and when I went inside that space, I just felt home,” Likoba said. The boutique will carry two styles of jumpsuits with very different price ranges, offering what she described as her “ready-to-wear” and “high fashion” selections. The former is geared toward serving the everyday clientele, featuring Parisian cuts and styles with an affordable spin. On the other end of the spectrum, the store will offer high-end selections with a price tag to match — between $4,000 and $9,000. 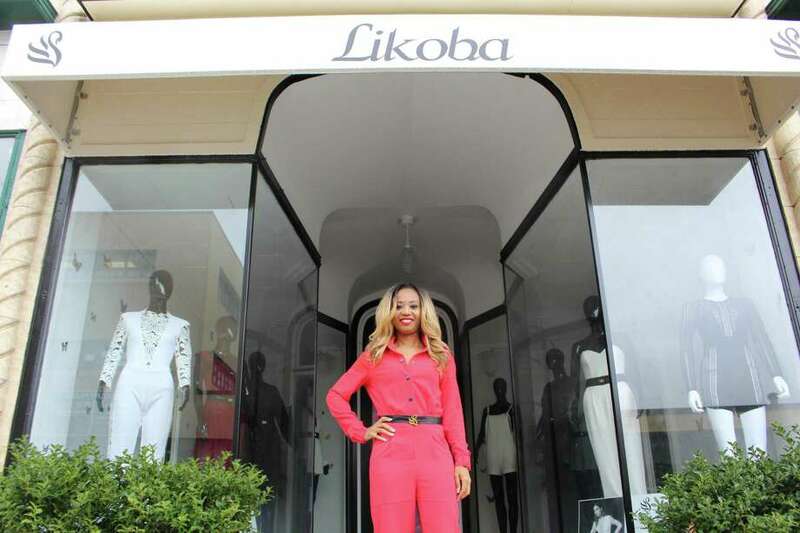 Focusing on the luxurious and more expensive materials, Likoba’s high-fashion options are suited more toward special events, celebrities and members of the entertainment industry. “I hope one day someone will wear one of my jumpsuits for the Met Gala,” she said. Likoba will carry a mix of other items, including makeup and skincare products. The Derby store will also offer men’s accessories. As the city looks to grow its offerings downtown, Derby Mayor Richard Dziekan said Likoba will add another reason for people to visit the Valley. While Derby may not seem the likeliest place for a high-fashion boutique, Bill Purcell, director of the Greater Valley Chamber of Commerce, cited a past when many of the downtowns in the Valley were lined with boutiques and shops. “You have to credit her for trying to bring that back,” Purcell said.